Mirvish+Gehry Toronto is a new condo development by Great Gulf currently in preconstruction at Duncan St. & King Street West, west of Toronto's Downtown core. The project consists of two towers, one on either side of Duncan Street where it meets King Street West, both across the street from Metro Hall, David Pecaut Square, and Roy Thomson Hall. 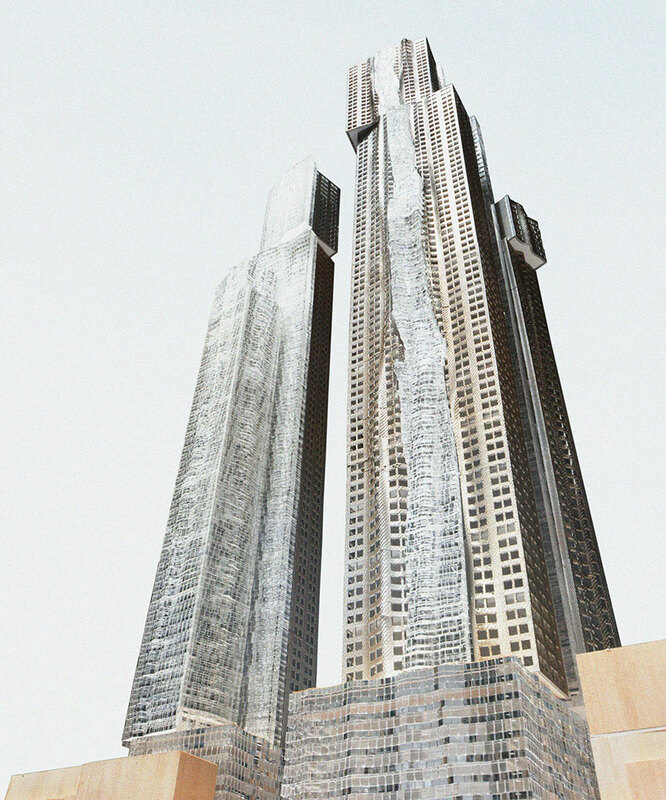 The west tower is approved for 92 storeys, 1005 feet / 305 metres, qualifying it as a 'Supertall'. Its podium is planned to have four levels of retail (including a mezzanine) and four levels of office space, with the condominium amenities on the podium-top level and the one above, with condo suites in tower floors above. The building will slightly overhang the Princess of Wales Theatre to the west. The east tower is approved for 82 storeys and 902 feet / 275 metres. Its podium will include three levels of retail (including a mezzanine) and three levels of office space, along with two levels for OCAD University. Like in the west tower, the first two levels will house the amenities—including the podium-top terrace—with the condo suites rising above.